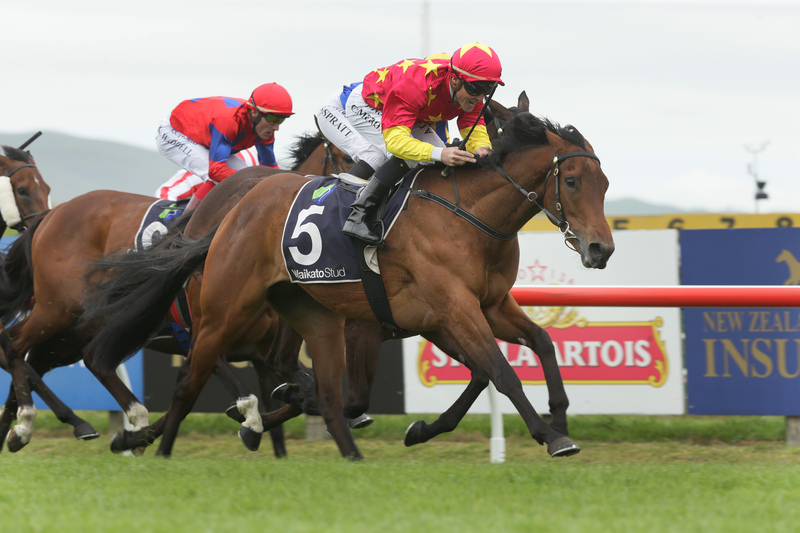 The well-known colours of the powerful China Horse Club were to the fore at Hastings on Saturday when Madison County produced a devastating sprint to capture the Gr.2 Sacred Falls Hawke’s Bay Guineas (1400m). 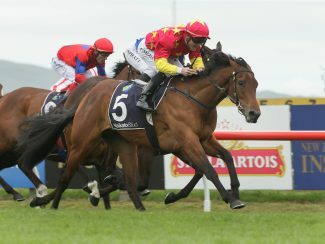 The stylish Pins gelding made it two wins from two starts at the Hastings track after he broke his maiden status there over 1300m in mid-April to round out his two-year-old season. From the Murray Baker and Andrew Forsman stable, Madison County had opened his new campaign with a fast-finishing second to race rival Melt in the Gr.3 Northland Breeders’ Stakes (1200m) at Ruakaka last month. This time the tables were turned as Madison County tracked Melt wherever she went in the early stages before dashing past the courageous filly in the final 100m of the contest. Melt lost no admirers with a gritty effort while locally trained runner King Louis fought bravely to finish up in third. Regular rider Matt Cameron was delighted with the win after experiencing a home straight hiccup although his post-race thoughts proved rather prophetic as Madison County decided to end the interview rather abruptly. “He had an awkward draw to contend with and I was three-wide but I had Melt in front of me so I knew I was following the second-best horse in the race,” he said. At that point Madison County decided enough was enough as he ducked sideways away from the interviewer before making a beeline for the winner’s enclosure. “He’s a promising horse who ran terrific at Ruakaka where he got home very strongly on a leader’s day,” co-trainer Murray Baker said. “We felt he was going to take a bit of time but he’s by Pins and they are very genuine horses. Baker will now look at the options available to his charge as the stable plot a path to the Gr.1 Al Basti Equiworld Dubai New Zealand 2000 Guineas (1600m) at Riccarton on November 10. “We’ll have to think about that one,” he said. That race is the Gr.2 James & Annie Sarten Memorial Stakes (1400m) scheduled for October 22 with the meeting venue yet to be decided as the Te Rapa track is currently undergoing extensive renovations. Bred by Garry Chittick, Madison County was a $36,000 purchase by the China Horse Club from Waikato Stud’s Select Sale draft at the 2017 National Yearling Sale at Karaka.